Oh well. At least we know that our team were the only ones to beat the European Champions during the Champions League this season. We also beat Manchester United this year. And over two legs we lost to the Spanish champions by a smaller goal difference than Ferguson's team did last night. A quick word for our friend Patrice Evra. I thought he put in a man of the match performance for Barcelona. I'm surprised that Messi pipped him to that accolade, after all he was instrumental in all three goals. "If he (Nasri) comes, he must know that here we have no room for error. Each year, you play to win. It is the culture of Manchester. And every year is a guarantee of a title." Anyway, lets move on to all things Arsenal. And we'll start with one quite extraordinary quote from Alex Song in the Sunday Mirror. "Sometimes we get on the pitch and we think ‘this game will be won easily’ that is something that we have to change. Because when you think you are going to win a game, and you don’t, it knocks the team." Now as supporters many go along to games thinking Arsenal should win comfortably. But should the players think that way? No. And this is where we've got a prime candidate in Alex Song who performs superbly in games against Manchester United and Chelsea, yet goes missing against Blackburn and Sunderland. Should the responsibility of motivating the players to perform in games which they think are won before they leave the dressing room lie with the player himself or the manager and his coaching staff? For me, the players have to be focused from kick-off until the final whistle. Why should they have to be motivated to pull on the Arsenal shirt and win? I believe Arsene Wenger should instill the tactics and belief each of his players need, but surely as a professional footballer, you shouldn't think about having won the game before you've already done so. For me, Song is obviously one of the player he is talking about. You don't see Cesc Fabregas or Robin van Persie giving less than 100% when they step out on to the pitch. Can you say the same about Song? I believe he lacks something. He's not improved in my eyes these last nine months and that is why I'm desperate for Arsene Wenger to bring someone in who can play his position and offer him competition for his place in the team. We need players who are self motivated. Who won't celebrate a victory until the referee has blown the final whistle. "I expect Arsene will be active in the transfer market. There have been a few names mentioned and I am sure there will be a few players in and out. "Obviously we haven’t won anything for a long time. The pressure has grown and the fans have been quite vocal lately. But the spirit in the dressing room is the same as always. "Everyone gets on with each other so there is nothing wrong there and, hopefully, we can win a trophy next season." According to the Mail on Sunday Arsene Wenger is already on holiday, so we might be having to wait a little longer for our first official signing. But I'm sure our manager will put his vacation to one side if our of our targets becomes available. We certainly won't miss out on anyone. And of course, we're expecting the first salvo from Catalonia this week when Barcelona offer us a derisory sum for Cesc Fabregas, which according to the Mail on Sunday will be £30m. I hope Ivan Gazidis will tell them, in the Arsenal way of course, where to stick it. There was talk earlier this week that Patrick Vieira could be returning to the club in some sort of coaching capacity. However it appears he likes the cash so much at Manchester City he's aiming to stay on for another year. A few transfer rumours for you? According to some of the Scottish papers yesterday, Kyle Bartley has been told he can leave Arsenal. This is not true. The central defender wants to be playing regular football and at the moment that cannot be guaranteed at Arsenal. So he's asked if he can go out on loan again next season. 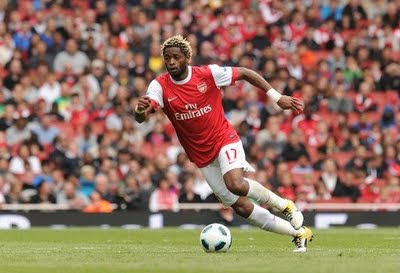 Arsene Wenger will assess him in pre-season before making any decision. The News of the World link us with a move for Birmingham's central defender Scott Dann. However the now Championship side want £15million for the 24-year-old. The club announced that it had received Premier League confirmation that Stan Kroenke had completed its change of control processes to become the club's majority shareholder. Stan Kroenke released a statement, with for me, one quite telling line. "Our constant aim will be to compete for silverware and championships." Not to win. Just to compete? Where is the pressure from the new majority shareholder on the manager to achieve our goals. Supporters don't want the team just to compete for silverware and championships. Ordinary teams do that. We are Arsenal and we want to win them, not be passengers along for the journey. Hopefully that won't be what the American is telling Arsene Wenger in private. And if you needed a transfer war chest story to go along with Kroenke's takeover heading through, our old trusted friend the Sunday Express doesn't fail us. Kroeke's going to hand Arsene Wenger £50m to spend apparently. Fancy some extra reading? Kenny Dalglish's Mail on Sunday covers the topic of why Jack Wilshere is right not to go to the European under-21 Championships.